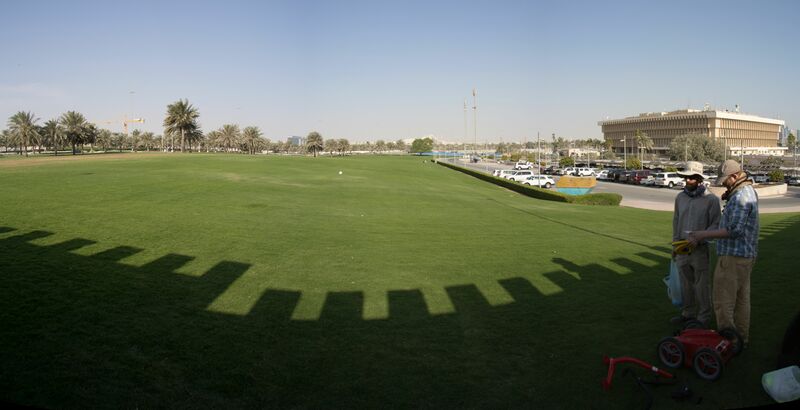 Earlier in the year Ed Blinkhorn from Archaeology South-East came out to Doha and worked with the Origins of Doha Project to undertake a ground penetrating radar survey (GPR) at Bida’. More details about the site can be found in our earlier blog post here. Ground penetrating radar can be used to locate and map underground features in three dimensions without damaging the buried archaeology by sending out a radio wave and recording the echoes that bounce back off buried objects. 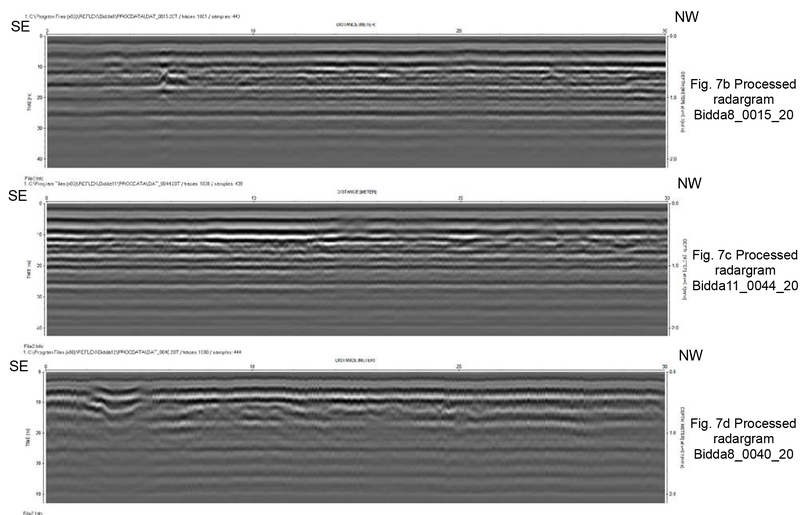 The raw data from the machine consists of radiogram images like the one below, in which buried features can be seen as distortions in the reflected wave. When these results are plotted out a series of rectangular structures can be seen, suggesting that the buried buildings of the earlier town still survive less than one metre below today’s green parkland. Aerial photographs of Bida’ in the late 1940s show the layout of the town at this time. However the GPR survey results show a different alignment and layout of buildings, suggesting an earlier set of buildings and streets survive on the site. Little is known of Bida’s early history. 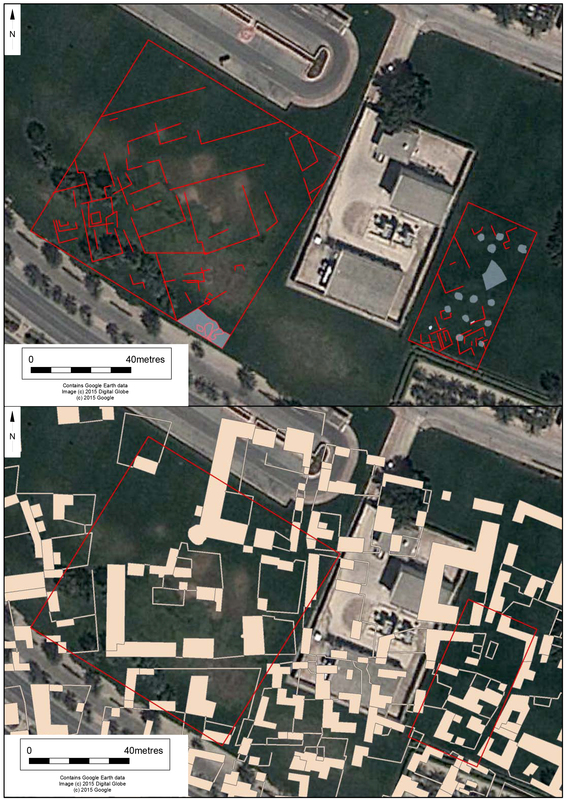 It predates Doha, and probably appears on the first know map of Qatar drawn by Carsten Niebuhr in 1765 The results of the GPR survey undertaken at the site hint at this buried past, and possibly show the houses of some of the first permanent inhabitants on the Doha Bay. Hopefully archaeological excavation in the future will shed further light on the earliest history of the city. The detailed technical report on the results of the survey can be downloaded here.